Boris Duhm is born 1971 in Aachen, Germany. He lives and works in Berlin and Budapest. Artist statement While Boris Duhms artist practice has been based on analogue and especially staged photography, he works in different media today: photography, painting, collage, installation and performance. His subject is the examination of "being different" in a society which increasingly builds on conformity of its members and in which marginalisation becomes the normal case. That is why Boris Duhm portrayed himself and others as "beings, not from this world", in a major number of visual, spatial and performative stagings. For these, he often uses wild nature landscapes as stages. In Duhm´s works the face of the artist, or better: his individual personality, gleams from behind the obvious, the visible, thus the visible might sound like an allegory. 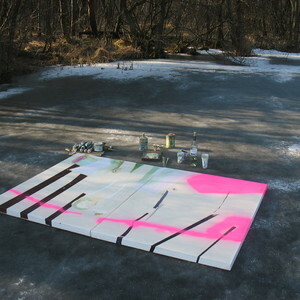 In Forest-Paintings, the stage itself becomes an allegoric content for the first time: a "wild" inner and outer nature. Boris Duhm has been working as teacher for fine art and photography at various universities and art schools in Europe and Asia. www.borisduhm.com Search "Boris Duhm" on google !